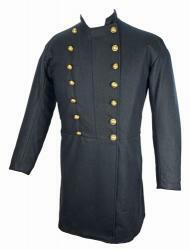 The Regulation Dress Coat for all Union Officers and Enlisted is the Double or Single Breasted Frock Coat appropriate for rank. 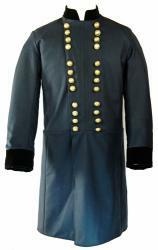 Enlisted Foot Soldiers wear a wear a 9 Button Single Breasted Frock Coat with Branch of Service piping trim. Second Lieutenant, First Lieutenant, and Captain wear a 9 Button Single Breasted Frock Coat. Major, Lieutenant Colonel, and Colonel wear a 14 Button Double Breasted Frock Coat. A Brigadier General wears a 16 Button 4x2 Double Breasted Frock Coat: 4 groups of 2 buttons per side. 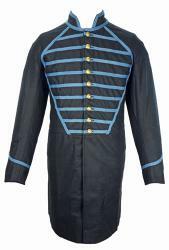 Major General and Lieutenant General wear an 18 Button 3x3 Double Breasted Frock Coat: 3 groups of 3 buttons per side. The General of the Army wears a 24 Button 3x4 Double Breasted Frock Coat: 3 groups of 4 buttons per side. All C&C Sutlery Frock Coats can be customized to meet your needs. In many cases, we can duplicate a frock coat from a picture. If the options below don't meet your needs, call us 208-398-7279 to discuss your specific customization. NEW, never worn C&C Sutlery14 Button Front US Senior Officer Frock Coat Size 40. This frock coat is appropriate for Major, Lt Colonel, and Colonel. The C&C Sutlery US Senior Officer Frock Coat is made from a finer grade, officer quality 15-16 oz. broadcloth Navy Blue Wool. Per US Army Regulations, the collar and cuffs are made of the same cloth as the coat. The Coat is Double Breasted with a 14 Button Front of Federal Eagle Buttons. The Functional Cuff is closed with 3 small Federal Eagle buttons. There is a 6 Button Pattern on the back of the split skirt and the folds of the skirt conceal additional pockets. 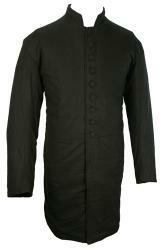 The Frock Coat is fully lined in Black Cotton and there is an inside breast pocket. The C&C Sutlery US Enlisted Frock Coat is made of 20 oz. Navy Blue Wool with Branch of Service Piping on the collar and the inverted "V" on the cuff. The Coat is Single Breasted with a 9 Button Front of Federal Eagle Buttons. The Functional Cuff is closed with 2 small Federal Eagle buttons. There is a 2 Button Pattern on the back of the split skirt and the folds of the skirt conceal additional pockets. The Frock Coat body and sleeves are lined in Natural Cotton Muslin. The Frock Coat Skirt is unlined and the Hem is left raw (unhemmed) per the originals. There is an inside breast pocket. This Frock Coat is custom made specifically for you and is subject to a MINIMUM 20% restocking fee. Please allow AT MINIMUM 4-6 weeks for delivery. Click to read our RETURN and EXCHANGE Policy. 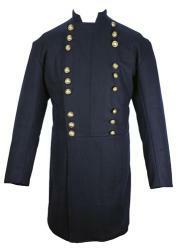 The C&C Sutlery US Enlisted Musician Frock Coat is made of 20 oz. Navy Blue Wool and features Branch of Service 1/2 inch Tape on the Coat Front with Branch or Service Piping Trim on the collar and the inverted "V" on the cuff. The Coat is Single Breasted with a 9 Button Front of Federal Eagle Buttons. The Functional Cuff is closed with 2 small Federal Eagle buttons. There is a 2 Button Pattern on the back of the split skirt and the folds of the skirt conceal additional pockets. The Frock Coat body and sleeves are lined in Natural Cotton Muslin. The Frock Coat Skirt is unlined and the Hem is left raw (unhemmed) per the originals. There is an inside breast pocket. 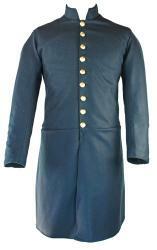 The US Junior Officer Frock Coat is appropriate for Second Lieutenant, First Lieutenant, and Captain. 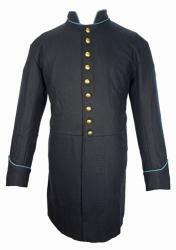 The C&C Sutlery Junior Officer Frock Coat is made from a finer grade, officer quality 15-16 oz. broadcloth Navy Blue Wool. Per US Army Regulations, the collar and cuffs are made of the same cloth as the coat. The Coat is Single Breasted with a 9 Button Front of Federal Eagle Buttons. The Functional Cuff is closed with 3 small Federal Eagle buttons. There is a 6 Button Pattern on the back of the split skirt and the folds of the skirt conceal additional pockets. The Frock Coat is fully lined in Black or Brown Cotton and there is an inside breast pocket. 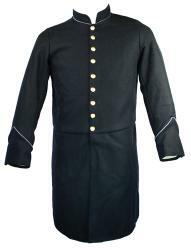 The US Senior Officer Frock Coat is appropriate for Major, Lt Colonel, and Colonel. The C&C Sutlery US Senior Officer Frock Coat is made from a finer grade, officer quality 15-16 oz. broadcloth Navy Blue Wool. Per US Army Regulations, the collar and cuffs are made of the same cloth as the coat. The Coat is Double Breasted with a 14 Button Front of Federal Eagle Buttons. The Functional Cuff is closed with 3 small Federal Eagle buttons. There is a 6 Button Pattern on the back of the split skirt and the folds of the skirt conceal additional pockets. The Frock Coat is fully lined in Black or Brown Cotton and there is an inside breast pocket. 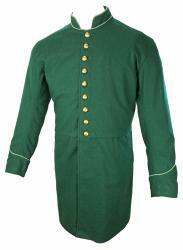 The US Senior Officer Frock coat is appropriate for Major, Lt Colonel, Colonel, and General. 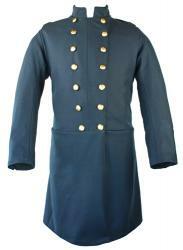 The US General's Frock Coat is appropriate for Brigadier General and Major General. 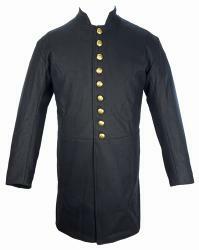 The C&C Sutlery US General Frock Coat is made from a finer grade, officer quality 15-16 oz. broadcloth Navy Blue Wool and features a Black Velvet Collar and Cuffs. The Coat is Double Breasted with a 16 Button Front in the 4x2 Brigadier General (1 star) Button Pattern (4 groups of 2 buttons per side) of Federal Eagle Buttons. The Functional Cuffs are closed with 3 small buttons. There is a 6 Button Pattern on the back of the split skirt and the folds of the skirt conceal additional pockets. The Frock Coat is fully lined in Black or Brown Cotton lining and there is an inside breast pocket. 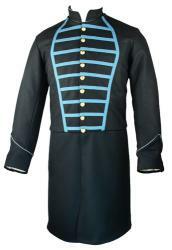 The C&C Sutlery US Lieutenant General and General of the Army Frock Coat is made from a finer grade, officer quality 15-16 oz. broadcloth Navy Blue Wool and features a Velvet Collar and Cuffs. The coat is Double Breasted with a 24 Button Front in the 3x4 General of the Army (3 star) Button Pattern (3 groups of 4 buttons per side) of Federal Eagle Buttons.The Functional Cuff is closed with 3 small Federal Eagle buttons. There is a 6 Button Pattern on the back of the split skirt and the folds of the skirt conceal additional pockets. The Frock Coat is fully lined in Black or Brown Cotton and there is an inside breast pocket. 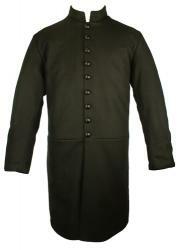 The C&C Sutlery M-1861 Chaplain Frock Coat is made from a finer grade, officer quality 15-16 oz. Black Broadcloth Wool. The Coat is Single Breasted with a 9 Button Front of Black Buttons. The Functional Cuff is closed with 3 smaller black buttons. There is a 6 Button Pattern on the back of the split skirt and the folds of the skirt conceal additional pockets.The Chaplain Frock Coat is fully lined in Black Cotton and there is an inside breast pocket. Federal Eagle Buttons instead of Black Buttons are available as an option. This Frock Coat is custom made specifically for you and is subject to a restocking fee. Please allow AT MINIMUM 4-6 weeks for delivery. Click to read our RETURN and EXCHANGE Policy. 1442. All officers shall wear a frock-coat of dark blue cloth, the skirt to extend from two-thirds to three-fourths of the distance from the top of the hip to the bent of the knee; single breasted for Captains and Lieutenants; double-breasted for all other grades. 1443. For a Major-General--two rows of buttons on the breast, nine in each row, placed by threes; the distance between each row, five and one-half inches at the top, and three and one-half inches at the bottom; standing-up collar, to rise no higher than to permit the chin to turn freely over it, to hook in front at the bottom, and slope thence up and backward at an angle of thirty degrees on each side; cuffs two and one-half inches deep to go around the sleeves parallel with the lower edge, and to button with three small buttons at the under seam; pockets in the folds of the skirts, with one button at the hip, and one at the end of each pocket, making four buttons on the back and skirt of the coat, the hip button to range with the lowest buttons on the breast; collar and cuffs to be of dark blue velvet; lining of the coat black. 1444. For a Brigadier-General --the same for a Major-General, except that there will be only eight buttons in each row on the breast, placed in pairs. 1445. For A Colonel--the same as for a Major-General, except that there will be only seven buttons in each row on the breast, placed at equal distances; collar and cuffs of the same color and material as the coat. 1446. For a Lieutenant-Colonel--the same as for a Colonel. 1447. For a Major--the same as for a Colonel. 1448. For a Captain--the same as for a Colonel, except that there will be only one row of nine buttons on the breasts, placed at equal distances. 1450. For a Second Lieutenant--the same as for a Captain. 1451. For a Brevet Second Lieutenant--the same as for a Captain. 1452. For a Medical Cadet--the same as for a Brevet Second Lieutenant.